Hurst Peirce + Malcolm LLP were commissioned to provide civil and structural design services for the construction of a new heavily serviced data centre in Milton Keynes. In conjunction with the client, the Architect felt the purpose to which the building was to be put warranted an innovative approach to the elevations and as shown in the adjacent photograph, we were given the opportunity to express the structure externally. 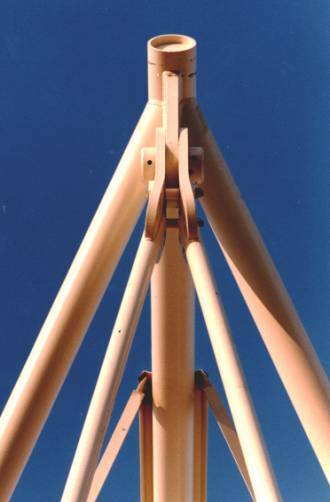 In order to achieve clear spans internally, triangular portal trusses were adopted with the ends of the trusses over sailing and tied to the feet of the posts to create a striking effect. 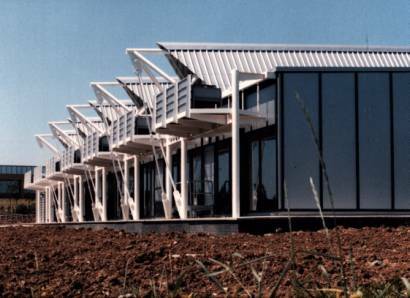 Plant space was at a premium within the building and with long spans and the complex roof profile, the location of the air-conditioning units presented a challenge for the design team. As shown in the adjacent photograph, the exposed structure was put to advantageous use to support high level plant rooms to mount the units and make a feature of what is usually hidden away.